I've been missing my kitchen time these past few months, thankfully I have this group of women who love learning new recipes, making a mess in the kitchen and EATING just as much as I do! Basically, I found my peeps! For now we are calling this group #GSMCookfest (check out the hashtag on IG!). Why GSM? It stands for Ginger, Sabrina and Michelle (The G also stands for Gia, Michelle's daughter because she loves to be in the kitchen as well!). We have gotten together a total of 4 times already in the past year, basically one cookfest for each quarter and we theme the menu accordingly. Yesterday's menu had to be Easter theme, of course! Truth be told, we set out to make more than that menu (mentioned above), sometimes mommy brains take over and you just forget. We forgot to make the Gazpacho! That's okay though, we always learn from our mistakes or mishaps in the kitchen, just like life. We are nowhere near perfect and that's what I love about this group. We just laugh about it and move on. And hey, it was a great menu anyway (even without the Gazpacho!)! 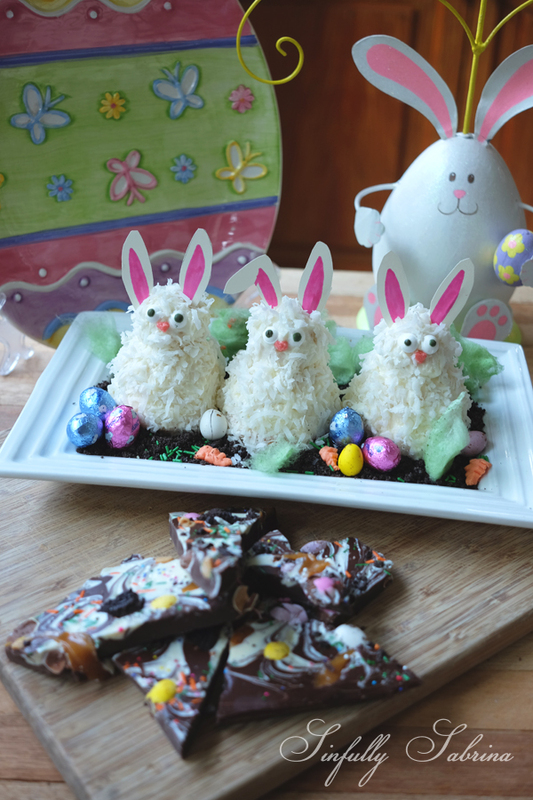 The main recipe you'll find below is for the Easter Chocolate Bark but please do browse through cause I'll be sharing short recipe versions of the other dishes we made for this Easter lunch gathering. 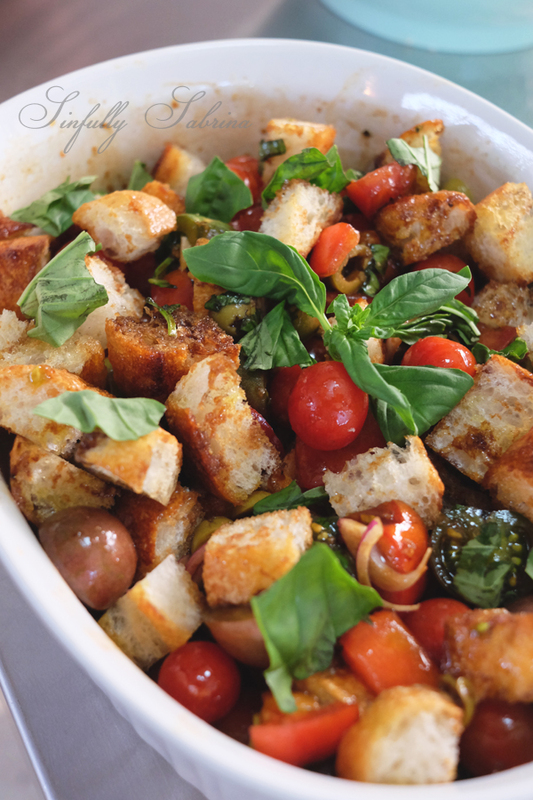 Our Panzanella Bread Salad was made by Michelle. The Italian in her was compelled to make a vibrant tomato salad. Appropriately so because summer is upon us and the tomatoes have been extra sweet lately! She used 3 different varieties of tomatoes: cherry, big salad and organic black/chocolate tomatoes. Just dice or half the tomatoes, finely minced garlic (1 or 2 cloves), thinly sliced red onions/shallots, fresh basil, olives and toss everything in extra virgin olive oil and balsamic vinegar. Toast for a few minutes some cubed french bread (toss them olive oil and season with salt and pepper) for a few minutes. Just before serving toss the toasted bread cubes and tomatoes making sure to slightly coat all of the bread with the dressing. Serve. This was such a fresh addition to the menu! And by the way, I am obsessed with those chocolate tomatoes! I hope I can find more of them in the market! 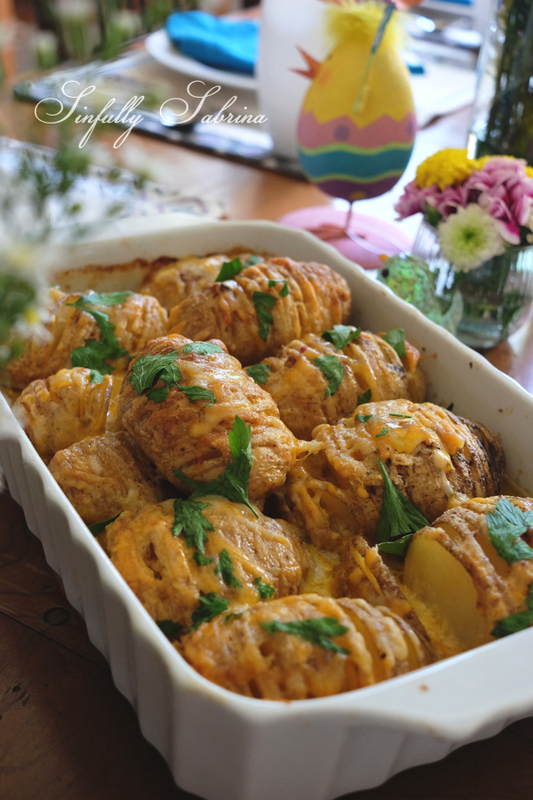 The cheesy hasselback potatoes were a win too! Butter, cheese and something starchy? You really can't go wrong! Preheat oven to 350 deg F. Cut slits into the potato, stopping just before you cut through so that the slices stay connected at the bottom of the potato. Lay the potates in an oven-safe casserole. Drizzle or brush over some melted butter then season with salt and pepper. We placed the cheese in between the potato cuts but leave some cheese behind to top them with when done. Bake for 40 minutes covered with foil and the remove foil and bake for another 30-40 minutes or until the potatoes are tender. Serve with chives, sour cream and bacon bits. If I'm looking for an easy version of a comforting dish, my go-to gal is Nigella Lawson. In my book, she has been dubbed the Queen of Comfort Food. So naturally, the 40 clove chicken recipe had to come from her. While baking, we were all swooning over the fantastic aroma! Chicken and a ton of garlic, YUM!!! These bunny cupcakes were just the cutest!!! We made basic vanilla cupcakes. Half of the cupcakes were made into cake balls (Mix the crumbled cupcakes and frosting then shape into balls), and the rest of the cupcakes were removed from the paper lining and inverted. The cake balls served as the head and then the whole head and body was frosted with a basic butter and cream cheese frosting. The body was then coated with coconut flakes and the eyes were placed into position. We also colored some of the frosting pink to make the nose and we also cut up the ears on bond paper. I hope through the #GSMCookfest you have gotten some ideas in hosting your own Easter Party!